The mighty Sequoia tree, principally existing today in northern California, embodied the breathtaking diversity of the North American continent when it was first discovered by European explorers in the 1830s. The Native American tribes of the west coast revered them. Early European explorers too marveled at this display of nature’s great flourish, spinning fantastic tales of ‘monster trees’ that breached the sky. The legends were proven true in the 1840s at the start of what would become known as the California Gold Rush. 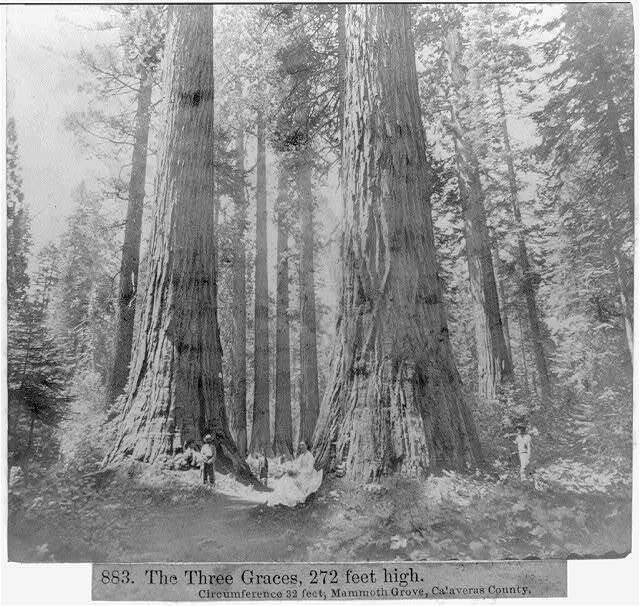 The first hotel, monopolizing on the wondrous discovery, was built near a Sequoia grove in Calaveras County. Each of the trees were given nicknames like ‘The Salem Witch’ and the ‘Old Bachelor’. ** But the grandest was ‘Mother of the Forest’, 363 feet tall and thousands of years old. 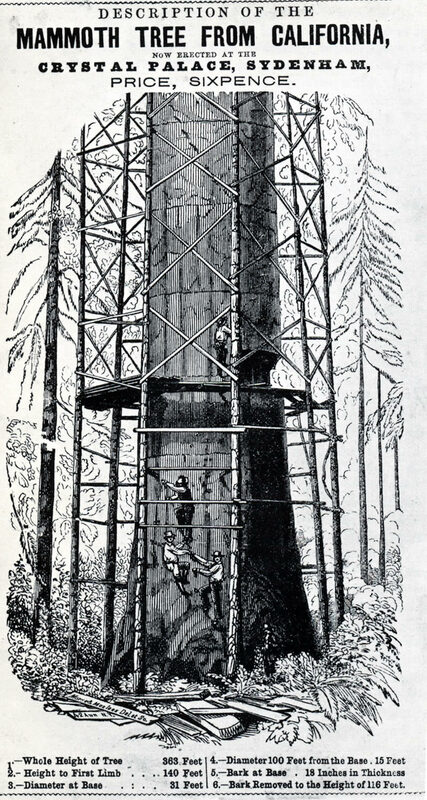 So naturally in 1854, the Mother of the Forest was stripped of much of its its bark and taken on a tour of the east, courtesy the entrepreneur George L Trask. The Mother of the Forest, pictured with 78 feet of the tree’s bark already removed. The bark was carefully sheared from the tree, to a height over 110 feet. 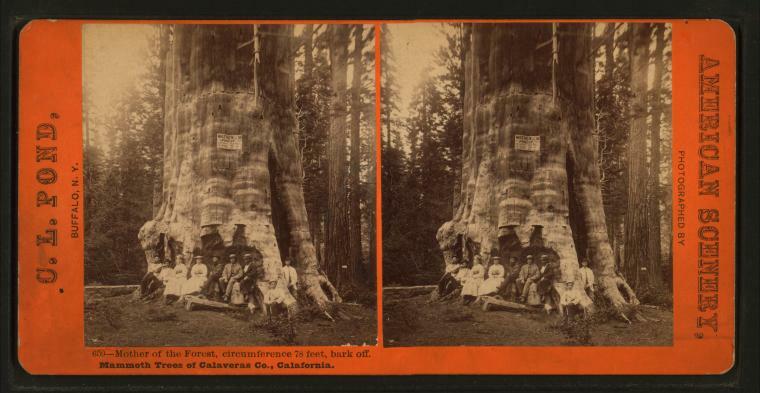 The disembodied bark was then “carted overland 80 miles to Stockton, whence it was shipped down the river to San Francisco, and then on a clipper vessel around Cape Horn to New York.” It arrived sometime in early 1855 for a grand display in the city. 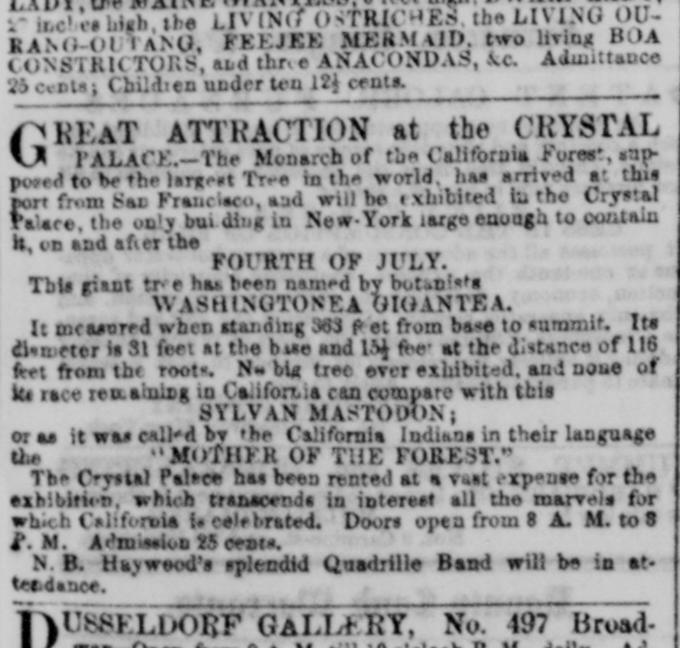 But where in New York City in 1855 could you exhibit such a gigantic thing? Why, there was only one place — the Crystal Palace. That summer, on July 4th, 1855, the tree bark, laid over a tall scaffolding, was carefully reconstructed in the Palace at the very spot where the George Washington equestrian statue once stood. An appropriate spot, as the exotic trees were originally given the scientific name of Washingtonea Gigantea. Alongside the constructed tree were a display of daguerreotypes of the tree in context with the forest, well before she was stripped of bark. It was promoted with a certain Barnum-eque style although without Barnum of course. (His failed tenure as the Crystal Palace president has soured him to the spot immeasurably.) According to the New York Sunday Courier, over 7,000 visitors came on the first day to admire the tree. “We have paid a visit to the Crystal Palace and have been gratified beyond our most sanguine expectations. We supposed that this concern was closed and that we should find nothing to please the eye beyond naked walls and vacant space; but, judge of our astonishment, when we found the space under the dome occupied by one of the greatest curiosities of the age…. “We very much enjoyed [the tree] but so we did the Automaton Man and the Charmed Snake story … and several other things which a more curious examination of reveals as belonging to the department of questionables. The journeys of this poor tree husk were not quite done. After the New York display, the pieces were placed upon a ship and taken to London to be displayed at their Crystal Palace. 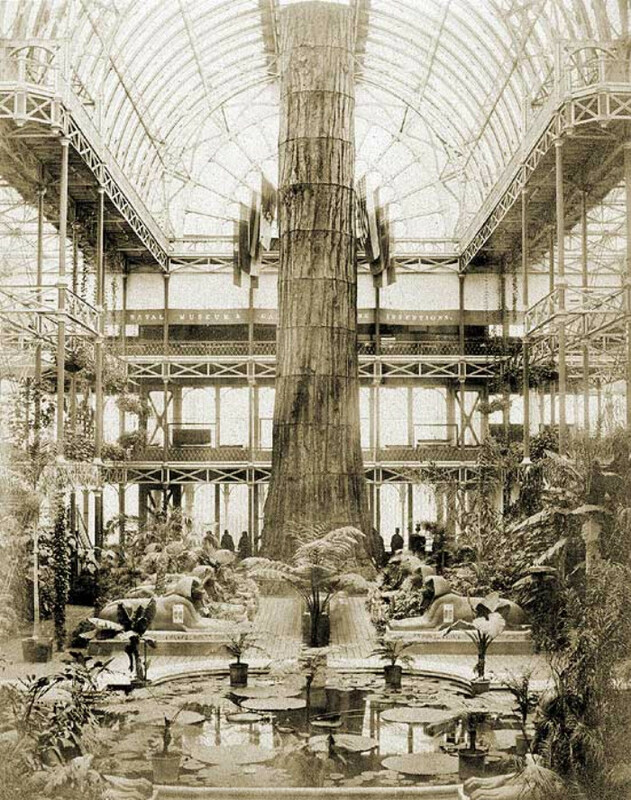 In 1866 a fire swept through London’s Crystal Palace, destroying this remainder of the Mother of the Forest.